Steven from Idaho sent in a request for more [tag]basketball coaching drills[/tag] he could use with his team. Try out this idea below from Tim and let me know how it goes for you. I learned this fun warmup [tag]basketball drill[/tag] from another website, but have not found another coach who’s ever heard of it. It is called ‘Slovakian Basketball’ and I don’t know why, but whenever I say “let’s play Slovakian”, the players can’t wait to get it going. 1. Everyone has a [tag]basketball[/tag] (offense and defense) that they must legally dribble at all times. 2. 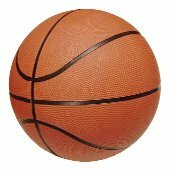 There is one additional basketball that is usually a different colour or at least recognizable, and it is the game ball – the only ball that can be used for shooting. 3. Basically you play regular basketball, while dribbling yours and handling the game ball legally when it comes to you. 4. If you lose your ball while in control of the game ball, it is a turnover. a) for less skilled players you can allow pulling up the dribble on their ball, and then restarting in a set time (say, 5 seconds), or for even more control you can create a 1 meter ‘no-go’ cylinder around the person who has the game ball too. b) for more skilled players you can allow them to knock away the personal ball from any player who has the game ball, or for even more challenge, declare open season on any ball.